D. Schroeder, J. Cook, F. Hirsch, S. Fenet, V. Muthuswamy (eds.). 2018. Ethics Dumping. Case Studies from North-South Research Collaborations, Springer Briefs in Research and Innovation Governance. 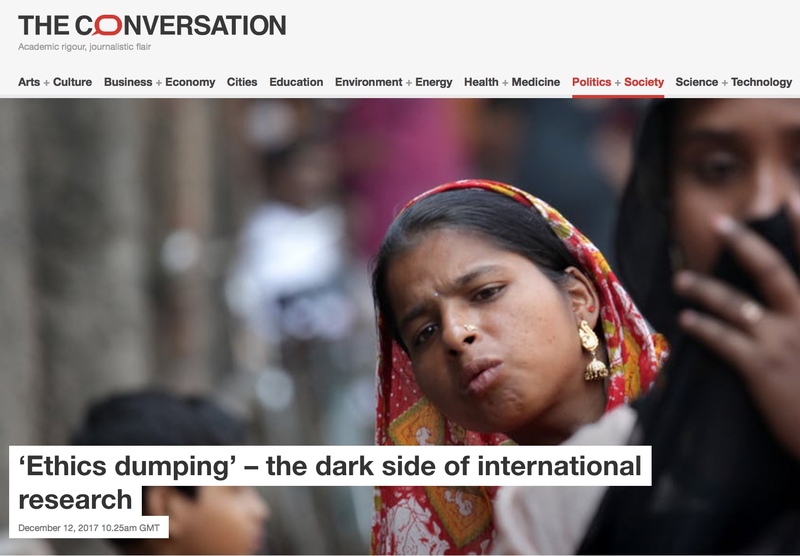 Ethics Dumping is the practice of exporting unethical research practices to low-and-middle-income countries (LMICs). Research that would be prohibited or severely restricted in a high-income country (HIC) is then carried out in a setting with lower regulatory capacity. 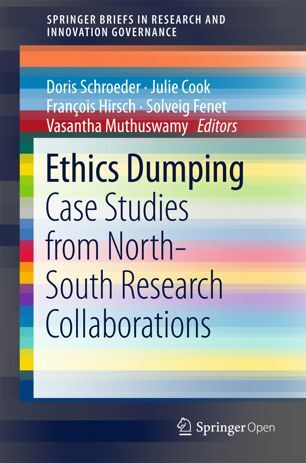 This introductory chapter will summarize Ethics Dumping cases published in a previous Springer Brief; relate the recorded cases to the need to formulate a Global Code of Conduct for Research in Resource-Poor Settings and briefly introduce all further chapters. This chapter reprints the Global Code of Conduct for Research in Resource-Poor Settings, which will be launched in May 2018. It is suitable as an awareness-raising tool and as guidance for new and established researchers of all disciplines and for funders concerned about Ethics Dumping. Values inspire, motivate and engage people to discharge obligations or duties. This chapter defines the four values chosen to structure the Global Code of Conduct for Research in Resource-Poor Settings after extensive engagement activities. The values are compared to the four principles by Beauchamp and Childress (non-maleficence, beneficence, autonomy and justice) and an argument is made for their use. In order to build the code, an exploitation risk table was produced. Risks were categorized according to the points at which vulnerability occurred, and were grouped according to the four values of fairness, respect, care and honesty. Trustworthiness is achieved when all four values are realized for all stakeholders (Persons, Institutions, Local communities, Countries) as well as Animals and the Environment. This chapter explains the exploitation risk table. The code was developed through extensive engagement with highly vulnerable populations, researchers, research councils, policy advisors, industry representatives and research funders. In addition, it was built on existing codes, which were carefully analysed. 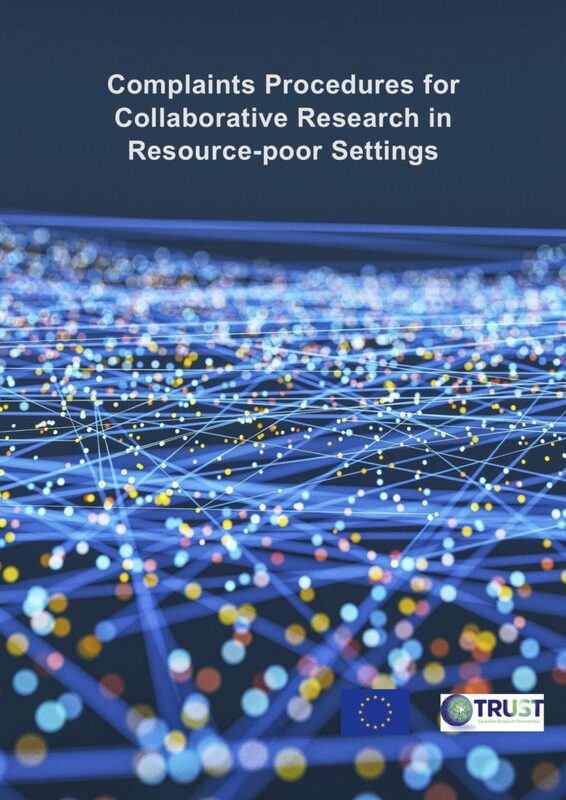 This chapter describes the engagement activities that were undertaken and concludes on the analysis of existing codes to protect vulnerable populations in resource-poor settings from exploitation in research. The San Code of Research Ethics was launched in March 2017 and achieved instant attention by international journals such as Nature, Scientific American and Science. Like its sister code described in this book, the San code is built around the values of fairness, respect, care and honesty. This chapter will summarize developments over the last 20 years, which were necessary before the San community in the South African Kalahari were able to launch their code for partnerships with researchers. A first assessment will be made to see whether the code can reduce the exploitation of the San community in research. A code is not enough to avoid ethics dumping. Even well-meaning researchers need good examples to build their equitable research partnerships. This chapter will introduce engagement techniques with local communities, a complaints procedure, which is accessible to highly vulnerable populations and summarize a resource built in parallel to the code, a fair research contracting tool. This chapter summarizes the main conclusions from the book and explains which further action is needed to reduce ethics dumping. When research contracts are negotiated between teams from high-income and teams from low-and-middle income settings, significant imbalances of power may exist. TRUST developed a toolkit to provide guidance and highlight key issues in this context. The TRUST guide for community participation in research,“Research with, not about, communities”, gives practical advice on community engagement, an ethical imperative for global researchers. 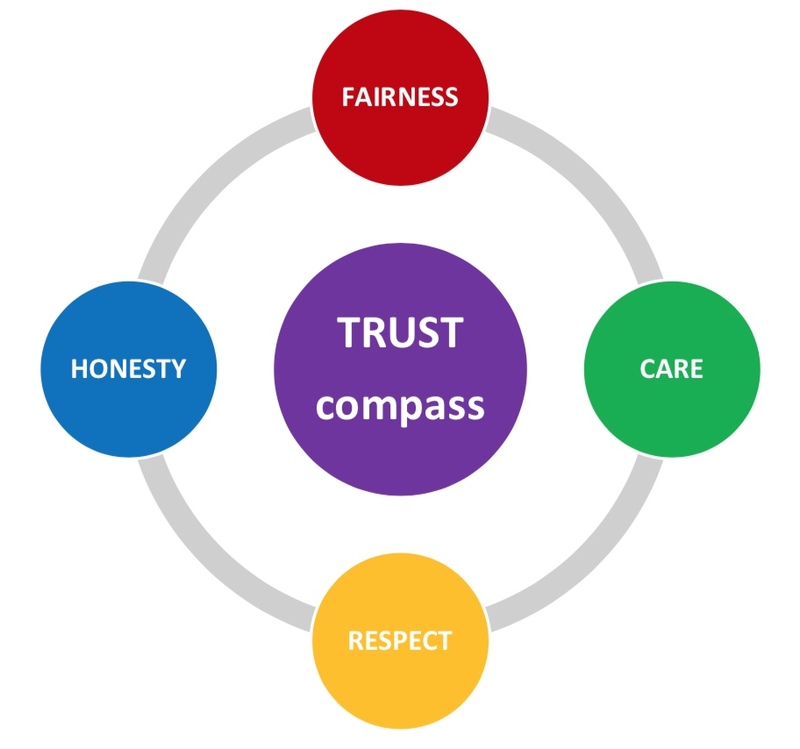 Readers are invited to use the TRUST compass (fairness, respect, care and honesty) during all five research stages (research question, research design, implementation, results, evaluation). The main advice is to build long-term, mutually beneficial relationships to apply before, during and after research studies. The guide is now a resource in the Resource Library of the AHRECS website. An effective complaints procedure offers a channel for raising concerns, both during and after a research study, and should help to ensure compliance with research ethics requirements. For this report, members of the TRUST team draw upon their experiences of working with vulnerable communities in LMICs to address practical, ethical and legal considerations for dealing with complaints. The document highlights the need for effective, user-friendly complaints procedures which are flexible and culturally sensitive across different forms of research in low and middle-income countries (LMICs).